How many times have I been asked how much two turns of the pan is? More than I can count! Or how about how much a palmful is? Same deal. 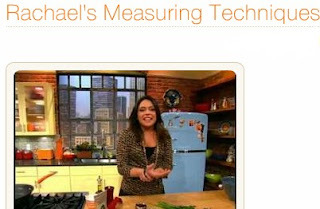 Rachael Ray has her very own measuring system and rookie Rachael Ray recipe makers can be easily confused by it. Lucky for us, Rachael now has the Food Flix Gallery on her talk show website and it features a video all about how to measure the Rachael Ray way. You can learn all about how much one turn of the pan is and how much half a palmful is right here. Go ahead. You can thank me later. How come I have not received a single "ciao" from you but you are still posting on your blog every day? Are you really just in your bathrobe in Roseville? I want to see pictures of foreign destinations--with you in them! Hi Bill! This is Madeline's friend, Kate. I am posting her pre-written blog entries for her as she is galavanting around Europe. She promised to bring me back something nice. I am posting through Wednesday of next week and then I am certain Madeline will want to brag about all of her exciting travels and post pictures, too. Well i'll say, I actually used Rachael's method and it worked! I am such a stickler for measuring that it took me a while to get out of that mode and "eyeball" it. LOL!! Kate is right. I promise I will brag. And that was my boss picking on my as usual. I told you that he reads this blog just to pick on me! Jennifer - I think the only thing I "eyeball" these days is EVOO. Other than that, I'm too scared. I know, I need professional help.